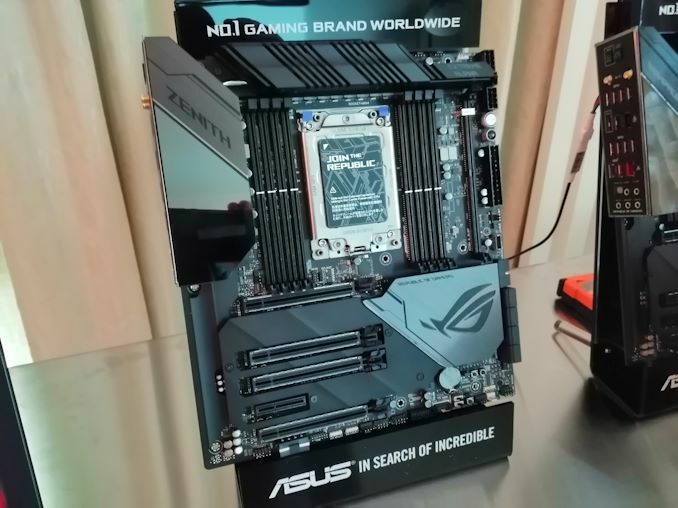 At CES 2019, ASUS showed off its new top tier X399 model with support for the 2nd generation Threadripper processors, the ROG Zenith Extreme Alpha. The new model has some striking differences to the ROG Zenith Extreme model including a new design, dual LAN (with an Aquantia 10G NIC) and an ASUS AURA Sync LiveDash 1.3 inch OLED screen built into the rear IO cover. 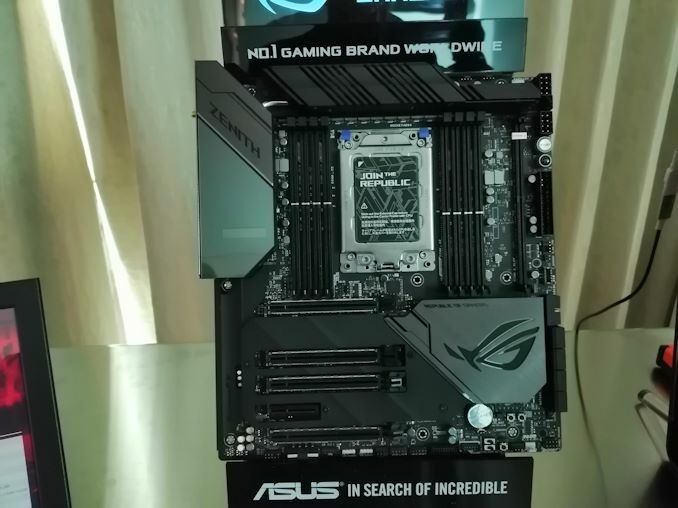 The ROG Zenith Extreme Alpha has a very clean and neutral look with the majority of the PCB covered with extensive heatsinks, an IO panel cover, and a new PCB cover around the PCIe slots. Another major visual update to the Zenith range is the rear panel cover has an integrated ASUS AURA Sync LiveDash 1.3 inch OLED screen which is also featured on the ASUS ROG Dominus Extreme model announced for Intel's 28-core Xeon W-3175X which was announced late last year. The ROG Zenith Extreme Alpha features an 8-phase power delivery made up of a total of 16 power stages. The power delivery heatsink extends around the power stages from the rear panel cover all the way to the two 8-pin 12 V ATX power connectors which allows AMD Threadripper processors to tap into as much power as it needs. There's support for 128 GB of RAM across a total of eight slots in quad channel mode with the ROG Zenith Extreme Alpha supporting speeds of up to DDR4-3600. From the current ASUS ROG Zenith Extreme model which we reviewed, the PCIe layout is similar to four full-length PCIe 3.0 slots offering up to three-way SLI and Crossfire multi-GPU configurations. The ROG Zenith Extreme Alpha's PCIe runs at x16/x8/x16/x8. ASUS has included a DIMM.2 slot too so users can add an extra two NVMe M.2 drives to the two M.2 slots located on the PCB underneath the shroud. A single U.2 port and eight SATA ports round off the Extreme Alpha's storage capabilities. Networking support includes dual-LAN with both the Alpha dropping a bundled 10GbE card and instead opting for an Aquantia AQC107 10 Gb LAN built right onto the board. The second LAN port is powered by an Intel I122AT GbE NIC. Onboard audio is taken care of by the ROG Supreme FX S1220A HD audio codec and a clear CMOS and BIOS flashback button are both present. USB capability is aplenty with a total of 12 USB 3.1 Gen1 Type-A ports in total; the rear panel has 8 of these and the rest are available through front panel headers. USB 3.1 Gen2 support consists of three Type-A ports and a single Type-C on the rear panel, while a single front panel header is available if users have USB 3.1 Gen2 compatible chassis. 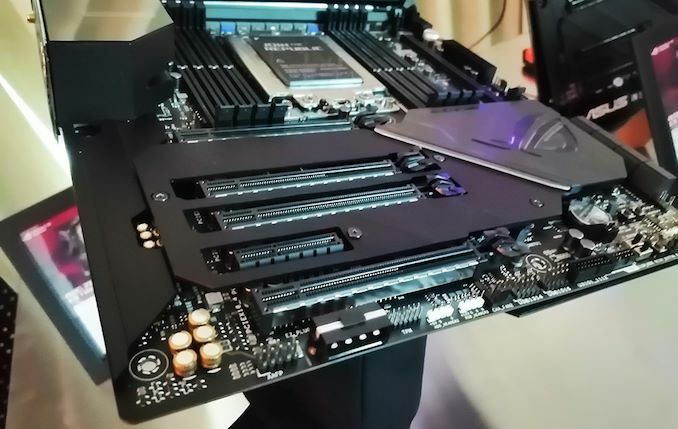 The ASUS ROG Zenith Extreme Alpha motherboard looks set to make its way to retail channels in Q1 2019, but there has been no information on pricing at present. Alongside the Alpha, ASUS is also releasing the Omega. A) I love this motherboard. It looks good, and I'm glad they're taking the Zenith line seriously.